Just over the mountains, Lake Chelan’s skies are bright blue nearly 300 days a year. Tired of late winter’s dreariness and kids with cabin fever? Just over the mountains, Lake Chelan’s skies are bright blue nearly 300 days a year — so kids have no excuse to sit around on a PlayStation (or nag). Here are ways to spend a weekend in Lake Chelan, where the summer crowds have disappeared, but the sun hasn’t. Nordic skiing isn’t so different from walking, and is a fine way to start kids off on skis. Echo Ridge has miles of groomed cross-country trails that present a variety of options for beginners, along with hills suitable for snowshoe exploration. Enjoy the best skiing the region’s seen in years, thanks to the endless sun and low temperatures. Check in with Lake Chelan Nordic Ski Club for suggested routes and trails. Take an all-day ferry ride with older kids past gorgeous fjords on “Lady of the Lake,” a ferry that takes passengers on a 50-mile journey from Chelan, past tiny towns only accessible by boat, to Stehekin and the unplugged town of Holden Village. Bring binoculars, bird-watching books and other flora-and-fauna guides; create a scavenger hunt of natural surprises. Successful scavengers get cinnamon rolls at Lake Chelan Artisan Bakery, when back in town. 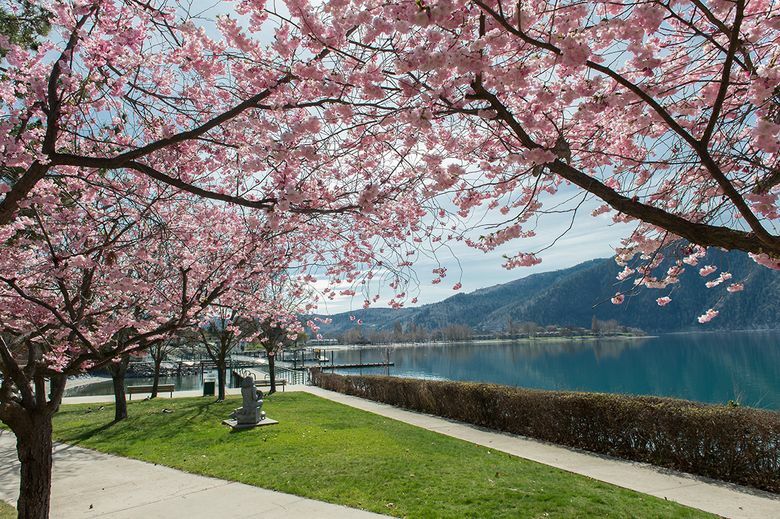 Spend time outside on the bright blue slides at Chelan Falls Park, beachcombing for rocks and minerals (the water level of Lake Chelan can drop more than 10 feet) at Don Morse Park, or going for a hike along the one-mile Riverwalk Park Loop Trail. More ambitious families can check snow coverage, accessibility and maintenance of trails for snowshoeing or traditional hiking at the Chelan Ranger District Trails site. Popular picks include the three-mile Chelan River Trail and the Little Bear Trail, a little over two miles long. Older kids can avoid being bored by packing their boards, and trying out ramps and rails, half-pipes and quarter-pipes. The new skate park within Don Morse Park also welcomes BMX bikes and inline skaters. Late winter/early spring also brings forth the luck of the Irish, with Chelan’s vibrant St. Patrick’s day celebration. Kids will love the “Top Dog Parade” on March 17, where dogs in fancy duds parade to the sound of bagpipes. And adults can enjoy a new event, Taste of the Irish, the ultimate in ale and whiskey tasting. If you’d like to head out for a family drive through the area’s gorgeous lakeside views, stops along the way include wine tasting for adults at Wapato Point Cellars, while the kids play lawn games or on the outdoor playground, while family-owned Blueberry Hills Farms puts out a kids’ menu of waffles and more. After you hike, ski or sail, head to Riverwalk Books, which devotes the entire upstairs to children’s and young adult titles, plus toys, games and puzzles. Pick out a picture book for a cozy evenings or a teen dystopian thriller. Or take the kids for an evening spin at Chelan Lanes’ 10 lanes, arcade games and full service restaurant. For pin-kings-in-training, automatic bumpers and lightweight balls make bowling easier for children 10 and younger. If traveling with tweens or teens, try out cosmic bowling, throwing strikes, surrounded by dance music, black lights and laser lights overhead, from 7 p.m. until 11 p.m. on weekends. On-site restaurant Mr. J’s Lane Eleven offers “Kid Bites” that include standard favorites like cheeseburgers, corndogs and grilled cheese — and come with the usual fries/onion rings choices — but an option for green salad, too. In fact, many of the area’s finer restaurants offer kids’ menus with fresh and picky-palate-pleasing options including Sorrento’s Ristorante at Tsillan Cellars’ Fruit and Veggie Plate, Kids Mac and Cheese, or Kids Pizza. Campbell’s Pub & Veranda puts fish and chips, burgers, pasta and even a fruit plate on the children’s menu at Campbell’s Resort. Or you can ready your thumbs for pinball and Ms. Pac-Man at Company Creek Pizza’s game room; the family-friendly pizza company also offers gluten-free options. At Lake Chelan Brewing Company, kids can place an order for brew chip nachos with melted cheese and side of beans, or a BBQ pork slider served with fruit or fries.